Wonderfull stop between Siena and San Gimigniano. 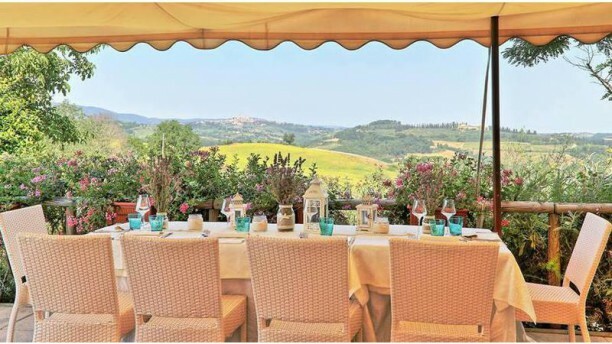 Quiet restaurant with view to San Gimigniano towers where you may try very good gnochi and delicious pasta! Una serata speciale per un'anniversario importante. The food was good (mine, the ravioli, quite a lot better than the ‘fried chicken’ my partner had). We thought to find a beautiful terrace but arrived there and found that the whole terrace was covered up due to the wind; it was not a problem though to open it up for us to make us feel more ‘outside’. Personnel was friendly but very eager to get us out (we arrived at 13.45, left by 15.00) which was a bit of a disappointment. Therefore (and because of the fried chicken) only a 7, not worth the 8.5 that it receives on IENS. Delicious food, friendly service and beautiful restaurant with beautiful views. Will definately return when back in Tuscany. There was no reservation in the Local But it was no Problem for a table because there were no People !